In 2018, WarmlyYours experienced several significant developments as a company that had profound impacts on sales performance. These changes included several product launches along with a more focused and strategic approach to radiant heating sales via ecommerce channels like Amazon, which nearly tripled in sales compared to the previous year. However, all of this was set against a backdrop of a nearly stagnate national housing market which has continued to depress remodeling activity for several consecutive quarters. Most projections for both the housing market and for remodeling activity expect to see continued issues deriving from a lack of available housing inventory. Despite these relatively tumultuous market factors, WarmlyYours was able to grow direct radiant heating consolidated sales by double digits in both Q4 and for the entire year of 2018. 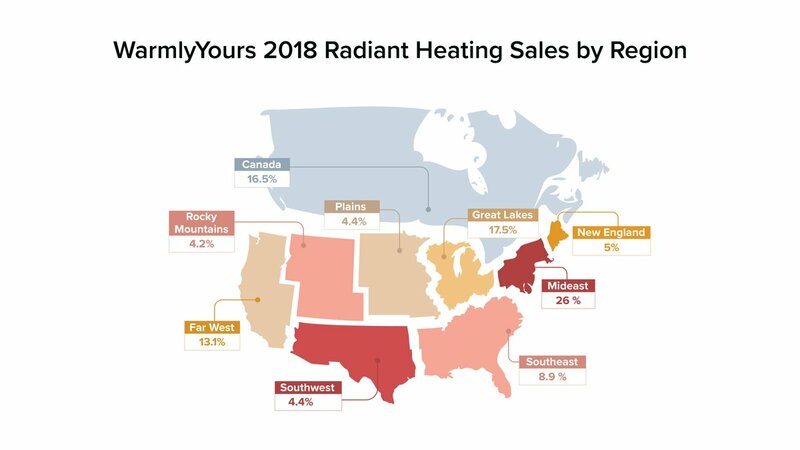 In this report, we’ll take a closer look at the performance of radiant heating product sales and analyze the impact that the national housing and remodeling markets are expected to have on future sales. WarmlyYours was one of the original pioneers of selling radiant heating products online. In fact, WarmlyYours was the very first floor heating provider to develop an online “quote building” tool for use by homeowners and professionals alike. However, in 2018, this tool received one of its most significant upgrades in recent years. This tool, now split into 2 separate tools (the Radiant Floor Heating Quote Builder and the Snow Melting Quote Builder), was relaunched in July of this year. 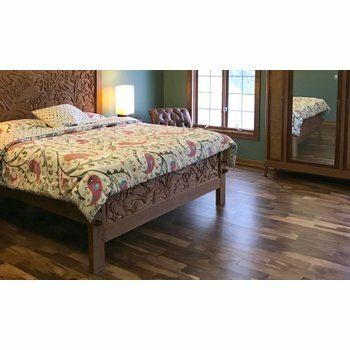 Besides product specialization, the new tools feature the ability to share radiant heating quotes via a unique URL generation functionality and the ability to much more expediently build a customized radiant heating quote. This new online tool undoubtedly helped increase visibility for several of WarmlyYours floor heating products including the Prodeso Membrane, TempZone Floor Heating Cable, and Environ Flex Roll, which all grew in 2018. Also in 2018, WarmlyYours onboarded several new product lines including, but not limited to, several towel warmer collections and hardwired Ember radiant panels. For towel warmers, there were 3 new collections released in stages throughout 2018. These were the Premier, Elevate, and Cosmopolitan collections. These were unique because each collection represented not only a new line of products but also a separate sales channel. For example, the Cosmopolitan Collection are only available from authorized WarmlyYours dealers. This development was initiated in part to help strengthen our relationships with our professional customers, said Julia Billen, owner and president of WarmlyYours. Towel warmers as a product line were a significant driver of overall sales for WarmlyYours. In fact, in 2018 towel warmers represented 21% of all sales for the company (up from 16% a year prior). This represents an 11.2% increase in consolidated sales, which was helped along by a robust 13.4% increase in the fourth quarter of last year. The most popular towel warmer model continued to be the Infinity (30% of all towel warmer sales in 2018) but the Riviera nearly caught up to it after increasing from 20% of towel warmer sales in 2017 to 28% in 2018. So it should be no surprise that the Riviera was the fastest growing model with 112.8% growth in 2018. This was followed by the Elements, Infinity, and Metropolitan with 60.5%, 36.4%, and 27.3% growth respectively. A significant factor for this growth was undoubtedly the sales of towel warmers via Amazon. Ever since WarmlyYours placed a concerted effort on expanding Amazon sales in the first quarter of 2018, the growth has been exponential. This focusing of effort was related to optimization of product descriptions and imagery along with expanded in-platform ad spend, which helped drive WarmlyYours’s fourth quarter growth. However, it should be noted that Amazon’s own strong Q4 2018 (up 19.7% from Q4 2017) was certainly a beneficial factor in WarmlyYours sales growth. WarmlyYours saw significant growth in every product category in both Q4 (total sales up 110.4%) and for all of 2018 (total sales up 183.5%) on Amazon, but the largest volume increase for the year was in towel warmers which grew 168.7%. A close second in total 2018 sales volume on Amazon was for floor heating (up 202.4%) and floor heating underlayments (up 628%) which posted an impressive 297.7% combined sales growth when compared to the previous year. While towel warmers have always been popular products for ecommerce sales, floor heating is experiencing an expansion. Part of the reason for this is that trade professionals are using Amazon more and more as a “one-stop-shop” for a lot of the products they might need for small to mid-sized remodeling projects. Similarly, some DIY homeowner customers are turning to Amazon because of a combination of factors including familiarity, trust, competitive pricing, and generally flexible return policies. Julia Billen said that she expects to see sales of radiant heating products continue to grow in popularity on Amazon. In addition to growth via Amazon, WarmlyYours saw several different channels flourish in the fourth quarter of 2018. The largest volume increase was in the trade professional channel which grew 18.1%. Other channels of growth included Amazon, homeowners, and other e-tailers. The trade professional channel’s growth is due in large part to growth in construction jobs. According to the U.S. Bureau of Labor Statistics, there were 7.2 million construction jobs available in July 2018, which is the highest level in a decade. The industry itself is being urged along by consumer demand for affordable housing. This is largely because after the Financial Crisis of 2008, national economic recovery greatly outpaced a hesitant construction industry. This led to a glut of buyers competing for a relatively fixed level of available homes, which in turn inflated the prices to prohibitive levels for many first time buyers. However, despite extremely increased prices early in 2018, there was a degree of de-acceleration in the fourth quarter. When comparing Jan. 2017 to Jan. 2018, the average home price had increased 5.62% but when comparing Nov. 2017 to Nov. 2018, the average home price had dropped by 6.72%. As usual, a relative cooldown is following greatly accelerated price increases. According to the National Association of Realtors (NAR), existing home sales in December 2018 declined 6.4% from the previous month and were down 10.3% from the previous year. Lawrence Yun, chief economist for NAR, said that relatively high interest rates throughout 2018 were largely to blame for the decrease. “The housing market is obviously very sensitive to mortgage rates. Softer sales in December reflected consumer search processes and contract signing activity in previous months when mortgage rates were higher than today. Now, with mortgage rates lower, some revival in home sales is expected going into spring,” said Yun. In addition to existing home sales, pending home sales were also down 2.2% from the previous month in Dec. 2018. Yun attributed this decrease to several factors. “The stock market correction hurt consumer confidence, record high home prices cut into affordability and mortgage rates were higher in October and November for consumers signing contracts in December,” he said. 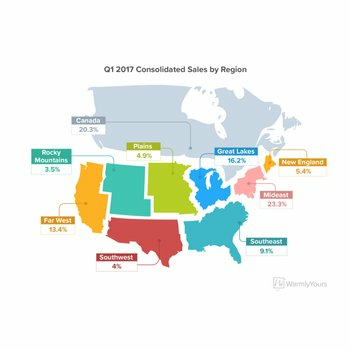 Because of this cool down, according to Realtor.com, available housing inventory actually increased by 5% in December nationally, with some major markets seeing increases of 10%. Additionally, about 15% of home listings in December saw a price reduction. And NAR also reported that the average “days on the market” for a home increased from 40 days in Dec. 2017 to 46 in Dec. 2018. Yun, however, cautioned against an overly optimistic interpretation of the modest increase in inventory. However, there may be some light at the end of the tunnel regarding housing inventory as new home construction is expected to expand in 2019. According to a joint press release from the U.S. Census Bureau and the U.S. Department of Housing and Urban Development, housing starts for single family residences in Nov. 2018 were up 3.2% compared to Oct. 2018. WarmlyYours is confident that 2019 will continue to be a strong year for us regarding radiant heating sales but that doesn’t mean that the immediate future doesn’t contain some obstacles. For example, the Leading Indicator of Remodeling Activity (LIRA) from the Joint Center for Housing Studies of Harvard University predicts that gains from remodeling and renovation spending will decrease from 7.5 in 2018 to just 5.1 percent in 2019. Ultimately, decreased national remodeling activity could have some impact on radiant heating sales due to the historically correlative relationship between the two. Still, we fully expect the expansion of sales volume to continue well into 2019 because of continued efforts on Amazon and online quoting tools for radiant heating. However, this expansion will probably constitute a further evolution in the makeup of our sales by product type. For example, electric floor heating made up 58% of total sales in 2017 but only 48% in 2018. Both snow melting and towel warmers showed significant growth in 2018 and we expect them to continue to grow this year, said Julia Billen.